When I was in Year 5 and I was going to Secondary School on thursdays instead of doing PE an ICT teacher let a student use his laptop, huge mistake! The student stole the excel spreadsheet containing every users username and password and then decided to start logging into every account he could and changing profile images, deleting files, stealing emails etc etc. He also stored a copy of the excel spreadsheet on his dropbox account. I'm pretty sure the student was hoping to get away with it but the student also made a huge mistake. He used the same computer he was previously logged into. IT support tracked him down and the student was forced to delete the file from his dropbox and then permanently excluded. The school did the smart thing and changed EVERYONE'S password in case the student had another back-up. Worst thing was, people were having their files deleted while they were logged on and that's how the school found out. If the student had only waited for the next day and didn't delete files, he would have probably got away with it. Our school has administrators and because of that we can't install the software needed for our home printers. GENERATION 361: The first time you see this, copy it into your sig on any forum and add 1 to the generation. Social experiment. I did not start this. I also have a story about kids logging into other accounts, thanks to usernames being first.lastXX and passwords being XXXX, where the X's are the last few digits of your student ID, and there literally being a list of names and student IDs on the computer, presumably for teachers to use to log into any student. The other kids think I hacked the school computers now because when they logged into my account the servers happened to glitch out just then (they had been glitching out occasionally for a while now) so they couldn't open any folders and all the desktop icons were missing. It's been confirmed that my school doesn't even have an IT department btw, and the same kids discovered that you can just open PowerShell and request admin permissions. Luckily, none of these kids actually want to do anything bad though, and there's not much damage to be done anyways since no one keeps anything important or personal on the student computers. I need to put blue screen of death screensavers on every school computer. YmFja3VwLXNpZ2d5LWlk Google this to see some of my posts. I am the school IT. After dropping out of high school, I ironically started working at a school as the IT guy. Most things are managed by the Department, but I do stuff like fixing computers, deploying software, managing printers, IT support and troubleshooting, etc. If it's something I can't solve or don't have permission to do, I just log an IT support request and the regional team can solve it. Pretty fast at night time when there's no one using all the bandwidth. 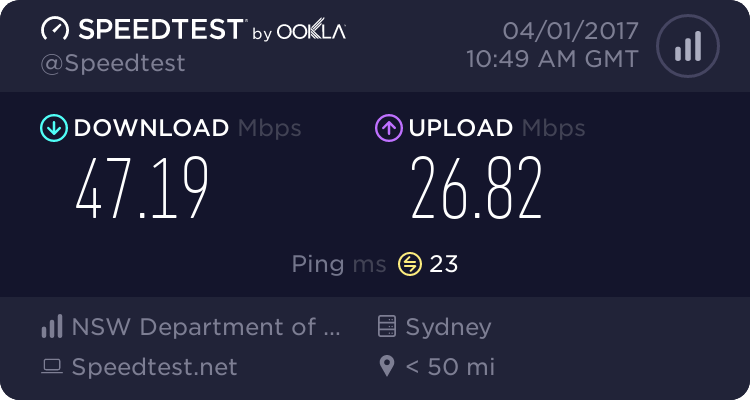 Schools here have a symmetrical (upload and download are the same speed) fibre link. Our internet traffic goes through the Department's proxy server in Sydney. That can make websites load faster even for schools with a slow connection. It also allows them to filter websites. Almost every computer at my school has access to a collaboration folder, mainly used for submitting tasks that we have done on the computer. I spent a while looking through the years of files stored there and found some funny stuff, empty folders and useless files. Another thing: our usernames are our first and last names joined with a “.” and default passwords were “password1”. Though it isn't too bad since the passwords can be changed. Do you go to a NSW public school? Just curious because of the collaboration folder and the username format (firstname.lastname). All schools here running eT4L servers have a Collaboration folder like the one you mentioned. Last year after our school migrated to the new server, students were storing heaps of games in the collaboration folder and their home folders. After emailing the deputy principal a long list of students who were storing games on the server, she warned them and it stopped. When I see students playing inappropriate games (such as GTA) in the library, I like to have a bit of fun. I walk past their computer and look at the 3 digit number written on it. Then I login to a computer near them (but not directly next to them) and look up the name of the computer that is associated with that number. I open Command Prompt and run the tasklist command to see a list of programs running on their computer, then use taskkill to kill the game. Sometimes I also make a message appear on their screen. When I was a student, I used to do things like change the Internet Explorer shortcut to open that screensaver. Another thing you can do is take a screenshot of the desktop and set it as the desktop background, then either kill explorer.exe in Task Manager or delete the real icons and hide the taskbar. Surprisingly, I found that he also hosted Minecraft on the school server. Learn how to create better projects and shops with Crater Courses. Yes, I do go to a NSW public high school. 2. cmd.exe sometimes isn't blocked. Please don't talk in ALL CAPS. https://hampton.pw/ Thoughts on my new site? Keyword is excessive. Because it wouldn't have had the same meaning if it was in lowercase, I wouldn't consider it excessive. In lowercase it would sound more sarcastic, read it in a casual voice to see what I mean. In uppercase, you would read it like it was louder and more important, turning it from sounding like a sarcastic remark to sounding like an exclamation to emphasise a point. EDIT: Quotes weren't properly closed. I open Command Prompt and run the tasklist command to see a list of programs running on their computer, then use taskkill to kill the game. Sometimes I also make a message appear on their screen. -Some Old Games: Racing Cats,Hungry Cat, Trapped, Mini-nation, ᴍAdvεnturᴇ﹗ and more! Probably to scare the student. Like a message saying something like "I can see you're player game-name"
Discuss bad and good school IT. Sadly the old topic got removed most likely due to people discussing piracy, methods of piracy, too much leet speak and discussing ways of breaking school IT policies (I have to say I contributed to that). Please don't use leetspeak unless it's necessary to a story. Don't discuss piracy or methods of piracy even if you say you don't encourage it. Please discuss things not only related to your schools IT problems in general, but be more specific. We started having a conversation about bad printer setups in the old thread which was interesting. If you see spam, non-needed leet speak or other posts talking about subjects of dubious legality, please report the post before the subject gets out of hand. This thread is for Good School IT, Bad School IT and anything related to school IT. Got some good news about your IT being a bit better lately? Discuss it here. Please don't just say things like “My school IT is good” or “My school IT is bad”, this is the advanced topics, pick some interesting points (such as pay to print printers) that people can expand upon and get a good conversation, go into technical specifics and see what other people have to say.